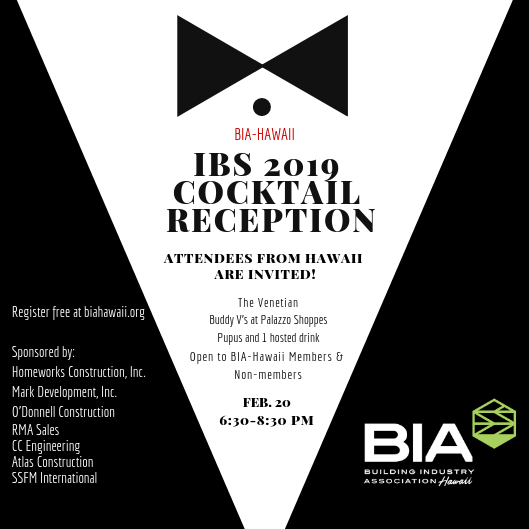 All attendees from Hawaii are cordially invited to the BIA-Hawaii Cocktail Reception on February 20th from 6:30 pm-8:30 pm at Buddy V's, located in the Venetian's Palazzo Shoppes. There is no charge for this event and all guests will enjoy complimentary pupus and one complimentary drink. Seatsd are limited so you need to register to attend. This event is sponsored by Homeworks Construction, Inc., Mark Development Inc., RMA Sales, CC Engineering and Construction, O'Donnell Construction, Atlas Construction, and SSFM International.